Over at the Macademic blog there is a list of good software on the Mac that is particularly useful for academics, teaching, writing, etc. I’ve used most of the software on this list (or at least experimented with a lot of them), but everyone’s workflow is different. Some of these will only frustrate your writing experience, especially if you’re diving into a big project like a dissertation that has unparalleled citation and formatting demands. So tread lightly and don’t make an impulse purchase, if that is your temptation. When I began writing my dissertation I had hoped to use something other than Microsoft Word, but I quickly found out that other applications would be unacceptable for submission. I wrote my prospectus in Scrivener, but I had to spend a couple of days after it was completed just converting the file into a .doc for review. That process was a real pain, particularly with in-text citations and footnotes. The writing experience in Scrivener is excellent, however, just not suitable for the parameters of a dissertation. 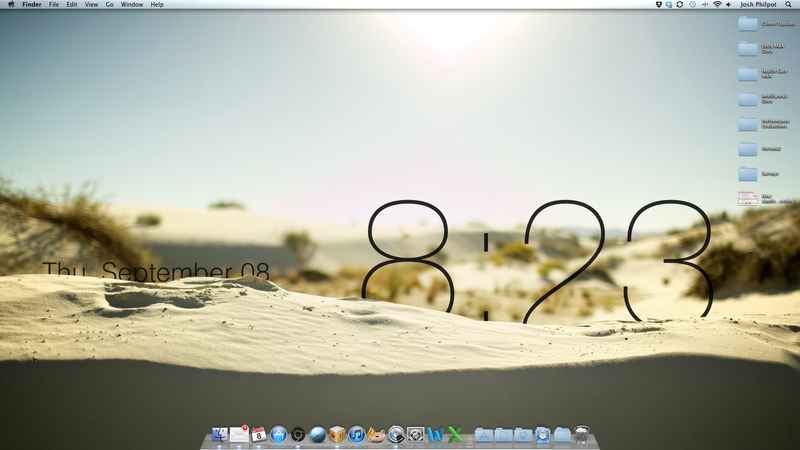 Since I have the date and time on the desktop I don’t need them in the Mac menu bar, usually on the top right. These two features are live and operated by a program called Geek Tool, which is a free app in the Mac App store and which is easy to use. Mine is in Helvetica font. The desktop image can be found here. Instructions for setup can be found here. I found the .Mail, Chrome, and Safari icons by doing a simple image search on Google. I personally hate the default icons for these apps, and these are more appealing to me. In my dock I also have the Reeder app, which has a great interface for reading blogs from your Google Reader. I’ve been using it for a long time and have no complaints. I also have Accordance software for Bible study and 1Password for managing the 50+ passwords I have online.